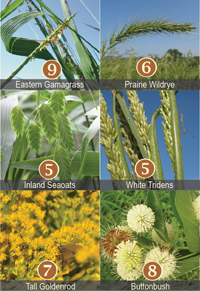 Ecosystem in a Bag of 38 native grass & wildflower species. Aid for Rebuilding Stream Bank Buffer Zones. 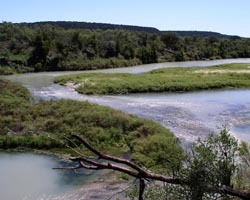 Texas alone is home to more than 3,700-streams & 15 major rivers. Totaling 191,000-miles, riparian areas are essential in storing and protecting water quality, preventing erosion, and providing nutrients and habitat for fish, fireflies and wildlife. Our actions can sustain healthy, vibrant natural riparian areas for all to enjoy now and in the future. Often, the best thing you can do for stream banks is leave them alone. Heavy equipment compacts soil, making recovery difficult. Cleared, manicured turf lawns are extremely low stabilizer plant communities offering little soil protection or water filtration. After flooding, leave downed trees and drift in place where practical. 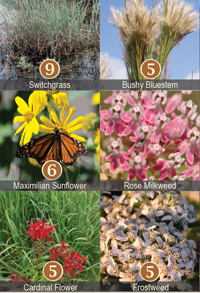 Plants are not equal in providing stability, native plants make riparian areas function. Stability Ratings (see brown circles on left with SR number) according to ability to withstand erosive forces of water. 6-7 minimum necessary for adequate bank stability. SR of individual plants is multiplied when in interconnected colonies. When planting in cool season (Sept - Feb), Cereal Rye Grain is recommended as a nurse crop for quick germination and erosion control.